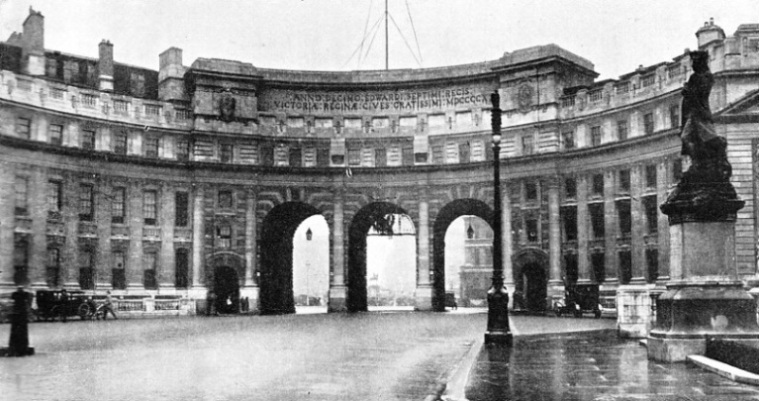 THE ADMIRALTY ARCH was designed by Sir Aston Webb as part of the national memorial to Queen Victoria, and forms an annexe to the main Admiralty buildings (right). On the right is a bronze statue of Captain Cook, the famous circumnavigator and explorer. The building abutting on the Arch to the left was used as the residence of the First Sea Lord until 1933. HIGH above the new Admiralty offices, behind the historic old building facing Whitehall, in London, there towers a network of aerials through which are received reports and messages from the commanders of British fleets and squadrons all over the world. From the Admiralty also are transmitted by land-line to powerful wireless stations the coded orders to the fleets. The story of the Admiralty is closely bound up with the history of Great Britain. Henry VIII instituted the forerunner of the Admiralty, a State department under the control of the Lord High Admiral of England. In addition, there was appointed a Navy Board to administer the civil departments that were responsible for the building, repair and maintenance of His Majesty’s ships. The civil administration was later vested in a board of principal officers under the Lord High Admiral. It was in 1512, shortly after Henry’s accession to the throne, that Woolwich Dockyard was established. The system of Naval control instituted in the reign of Henry VIII was in force for some three hundred years and carried the fortunes of the country through all the wars against the Spaniards, Dutch and French. In 1628, during the reign of Charles I, the Duke of Buckingham, Lord High Admiral of England, was assassinated and the office was placed in commission, under the control of a Board of Commissioners. Samuel Pepys, the famous diarist, whose writings throw so much light on the early administration of the Navy, was appointed the first Secretary to the Admiralty in 1673. In 1690, during the reign of William and Mary, Parliament passed the Admiralty Act, vesting in the Commissioners the powers formerly held by the Lord High Admiral of England. The Admiralty Commission was dissolved in 1701, but was reconstituted in 1709 on the death of Prince George of Denmark, who had been appointed Lord High Admiral. The office has been held in commission from that time onwards, however, except for a short period (1827-28) when the Duke of Clarence was Lord High Admiral. The Board of the Admiralty comprised a number of “Lords Commissioners” headed by a First Lord. In 1832 Sir James Graham instituted reforms and amalgamated the Admiralty and the Navy Board. By the provisions of the Admiralty Act of 1832, two Lords in committee could legalize any action of the Board. The responsibility and powers of the First Lord of the Admiralty were laid down by an Order in Council dated January 14, 1869, and a later Order (March 19, 1872) made the First Lord responsible to the Sovereign and to Parliament for all the business of the Admiralty. Before the signing of these Orders, the First Lord of the Admiralty had exercised considerable authority. 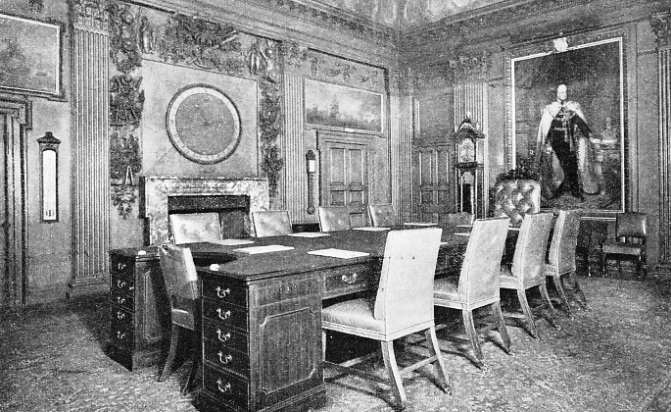 As originally constituted, it was decreed that the Admiralty Board should meet frequently to ensure full discussion on all matters relative to the Navy. About 1860, however, the sittings of the Board ceased to be effective. This was a condition of affairs that was to lead to serious difficulties. In 1868 Mr. Gladstone appointed Mr. H. C. Eardley Childers First Lord, and he saw fit to introduce a new system at the Admiralty. Free intercommunication between members of the Board was hampered by new regulations and the sittings of the Board were discontinued altogether. Matters were brought to a head by the disaster to HMS Captain. This vessel was a masted ship, with a low freeboard, carrying her guns in revolving turrets fore and aft. Despite opinions passed that she would be unsafe in a seaway, her designer, Captain Cowper Phipps Coles, RN, persuaded the Admiralty, in 1866, to authorize construction. The Captain was commissioned early in 1870 and she capsized and sank in the Bay of Biscay on September 7 of that year. Mr. Childers retired from the Admiralty in March 1871, and his successor Mr. (afterwards Viscount) Goschen reverted to the earlier system of meetings and discussion for the whole Board. 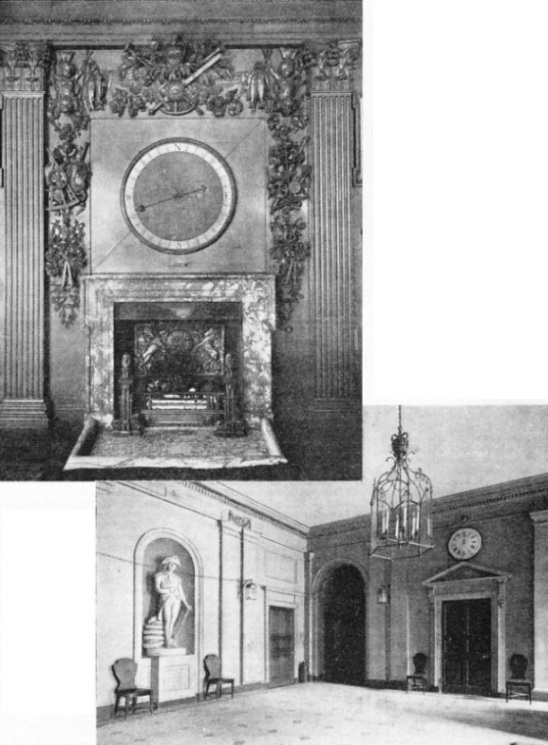 THE UNIQUE CHIMNEY-PIECE in the Board Room of the Admiralty. The carving represents navigational instruments weapons, fantastic figures, fish, fruit and flowers. The wind dial, which dates from the reign of Queen Anne (1702-14), has a map in the centre. The Board of Admiralty, serving as Commissioners for the office of Lord High Admiral of England, consists of ten members. They are the First Lord, the First Sea Lord, the Second Sea Lord, the Third Sea Lord and Controller, the Fourth Sea Lord, the Deputy Chief of the Naval Staff, the Assistant Chief of the Naval Staff, the Parliamentary and Financial Secretary, the Civil Lord, and the Permanent Secretary. The First Lord, the Parliamentary and Financial Secretary, and the Civil Lord are members of the Government; the Permanent Secretary is a Civil Servant, the remaining members of the Board are naval officers of Flag Rank on the active list. The First Lord of the Admiralty is a member of the Cabinet. Through him the Navy receives its directions in accordance with the policy of the Government. He is advised on all naval matters by the professional members of the Board. In the hands of the First Lord are all promotions and removals from the Service and the bestowal of honours and rewards. He also appoints flag officers, captains and the highest officers in the Navy. Of the Sea Lords who support the First Lord, the chief is the First Sea Lord, to whom his colleagues on the Board are subordinate, a position confirmed by an Order in Council signed in 1904. The First Sea Lord is a naval officer of wide experience. He deals with all large questions of naval policy, maritime warfare, and the organization, distribution and fighting efficiency of the fleet. As Chief of the Naval Staff he advises upon and generally directs operations of war. The Second Sea Lord is made responsible for the personnel of the Navy. The manning of the fleets and the drafting of officers and men to ships on mobilization come within his province. He also has the control of the Royal Naval Reserve and of the naval training establishments and colleges at Greenwich, Dartmouth and elsewhere. Next on the list of Sea Lords is the Third Sea Lord and Controller. His function is the supply and maintenance of material for the Fleet and the upkeep of dockyards. In these duties he is assisted by a Director of Stores at home and abroad, a Director of Dockyards and an Inspector of Dockyards Expenses Accounts. The Third Sea Lord is also in charge of all building operations and is responsible for the supply of guns, torpedo tubes and their fittings. He submits to the Board plans for new warships. The Fourth Sea Lord is responsible for transport, supplies and victualling. Victualling does not relate only to bread, cheese and pickles, nor the wherewithal to “splice the main brace”. It includes also the supplying of clothing, uniforms and badges of rank, in addition to provisions. The Fourth Sea Lord also controls the fuelling arrangements for the Navy, and under his care is the regulation of naval hospitals. He is assisted by the Director of Stores and by the Director of Victualling. The Civil Lord assists the First Lord in political and parliamentary duties. His chief duty is to superintend all works and labour services. He is responsible for Admiralty buildings and stores of building materials, as well as for the buying of land for building purposes. Under his charge, also, is the large civilian stafl of the various naval establishments. The duties of the Parliamentary and Financial Secretary are concerned with finance and the Navy estimates and parliamentary matters. The Permanent Secretary to the Admiralty is responsible for the interrelation and office organization of the various departments that serve the Royal Navy. He acts as Secretary to the Board, and it is his duty to scrutinize all questions involving expenditure and to advise the Board as to the possibility of effecting economies therein. 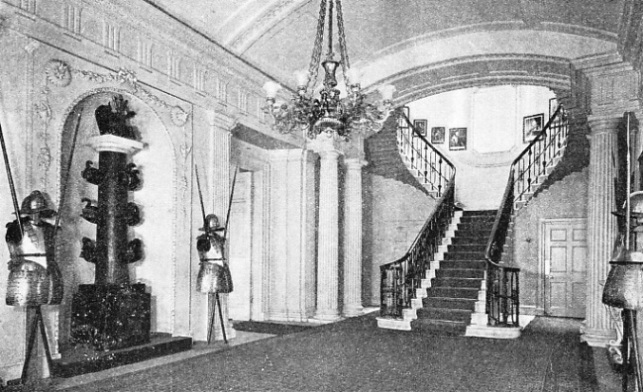 THE FINE STAIRCASE HALL in the First Lord’s residence at the Admiralty. It was rebuilt between the years 1735 and 1788. In the alcove between the two suits of armour on the left of the photograph is an old cast-iron stove. The First Lord is a member of the Cabinet and through him the Navy receives its instructions in accordance with the policy of the Government. He is responsible to the First Lord for the discipline, welfare, promotion and pay of the secretariats and civilian staffs of the Admiralty and of naval dockyards and shore establishments generally. An idea of the magnitude of this task may be gained when it is realized that the civilian staff of the Admiralty alone includes some 3,100 persons. In 1911, with Europe heading for war, Mr. Winston Churchill, as First Lord, established a Naval War Staff on a proper basis to consider strategy and other matters relative to the employment of the Fleet. The importance and the far-reaching consequences of Mr. Churchill’s work as First Lord of the Admiralty cannot he over-emphasized. The War Staff was divided into three departments - Intelligence, dealing with war information; Operations, dealing with war plans, and Mobilization. The whole was placed under a Flag Officer as Chief of the War Staff, responsible to the First Sea Lord. The preparatory work of the War Staff was completed, in every detail, in 1913. In the following year Mr. Churchill and his First Sea Lord, Prince Louis of Battenberg, were called upon to face the grim drama of war and to use for the country’s defence the vast machine of the Royal Navy. In 1914, the annual fleet manoeuvres had, at the instance of Mr. Churchill and Prince Louis, taken the form of a test mobilization and royal review. The eleven days preceding the entry of Great Britain into war were days of great activity at the Admiralty. At the beginning of that period the heads of the Navy were well aware that war was almost a certainty. During the week-end of July 24-27, Mr. Churchill, after discussion with the First Sea Lord, Prince Louis of Battenberg, gave orders that the First and Second Fleets should not disperse, although due to do so as manoeuvres had been concluded. On the following Monday morning Mr. Churchill issued a secret warning to all naval commanders-in-chief that war was probable and preparations were to be made to shadow possible hostile warships. On Wednesday, July 29, naval harbours were cleared, bridges guarded, steamers boarded and examined, and a watch set along the coasts. On that day, the warning telegram to be ready for war was sent to all commanders-in chief. The ships of the Grand Fleet were ordered from Portland to Scapa Flow, Orkney, to take up their battle stations. In the dead of night, with all lights “dowsed”, eighteen miles of warships passed in secrecy and at high speed through the Strait of Dover to screen the British Isles from the menace across the North Sea. On August 1 Mr. Churchill issued the mobilization orders that placed Great Britain’s naval might on a war basis. At 11 o’clock on the night of August 4, 1914, the war telegram, “Commence hostilities against Germany”, was sent from the Admiralty, and the King’s ships all over the world “cleared for action”. In May 1917, the First Sea Lord was made Chief of the Naval Staff and two more naval members were added to the Board. These officers were the the Deputy Chief of the Naval Staff and the Assistant Chief of the Naval Staff. For a short time there was also a third addition, the Deputy First Sea Lord. In the autumn of 1917 the whole position was revised. The Naval Staff system was put on a new and sounder basis and was separated from the administration side of the Admiralty. The First Lord of the Admiralty, then Sir Eric Geddes, was accordingly made president of two Board committees, one to control naval operations, the other to deal with the maintenance of the fleets. The First Sea Lord was made responsible for the issue to the Fleet in his own name of' orders for operations of war and movements generally. Probably in no other Government department have there been witnessed such great changes as those at the Admiralty. The buildings have been extended as circumstances dictated and their equipment provides many an interesting contrast with bygone days.